Nike has released “Keep the Ball Alive”, a television advertising campaign, in Australia and New Zealand in time for the Rugby World Cup. The commercial begins with a guy crashing through a glass window, rugby union ball in hand. Other London pedestrians join in the escalating game, jumping off buses, throwing in at the traffic lights and even jumping off tall buildings. The ad features a series of international rugby stars including former Wallaby Tim Horan, Ireland’s Keith Wood, France’s Fabien Galthie, England’s Lawrence Dallaglio, Dan Luger, James Simpson-Daniel and Fijian Rupeni Caucaunibuca. The web site Keep the Ball Alive has an interactive competition running during the World Cup in October and November 2003. All to do with spotting 5 symbols. The TV advert is available to play right there. You enter by sending an SMS text message – the details are sent back to you by SMS and recorded message I managed to download a groovy ‘where is the love’ mobile phone tone after collecting the missing answers from people in a chat list. BandT reports that Nike’s had a few problems keeping the ad alive. After complaints to the Australian Standards Board, Publicis Mojo Australia and Nike were given the go ahead. But the UK’s Broadcast Advertising Clearance Centre (BACC) were not so impressed and banned the ad. Probably something to do with jumping up on a car and smashing the windscreen. 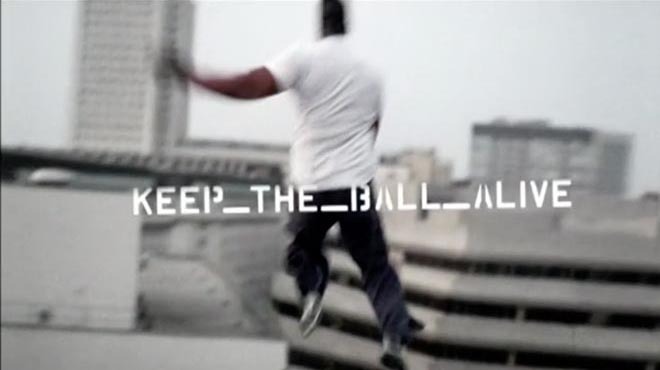 Keep the Ball Alive was created by Publicis Mojo, Melbourne, by creative director Darren Spiller, art directors/copywriters Christy Peacock and Steve Jackson, and agency producer Corey Esse. Filming was shot by director Steve Rogers via Revolver Films and Biscuit Filmworks with editor Drew Thompson, executive producer Michael Ritchie, line producer Georgina Wilson and director of photography Mandy Walker. Editor was Bernard Garry at Karl Marks. Post Production was done at Animal Logic by producer Sarah Hiddlestone, animator Craig Baxter and flame compositor Leoni Willis. What are you to me?”.